"He was a gentleman of commanding talents and exquisite wit, whose devoted ness to his sacred duties, kindness of manner, and sweet companionship, are still sources of grateful and fond remembrance. In every township we find traces of his ministrations and endearing recollections of his affectionate visits." from History of the Church in Eastern Canada and Newfoundland by John Langtry, M.A., D.C.L., Rector of S. Luke's, Toronto, and Prolocutor of the Provincial Synod of Canada. London, Brighton and New York: Society for Promoting Christian Knowledge, 1892. Rev. Robert Addison's church St Mark's Anglican Church, 41 Byron St., Niagara-on-the-Lake is the oldest Anglican Church in continuous use in Ontario. "One of the earliest Anglican churches in the province, St. Mark's was begun in 1804 to serve a congregation organized twelve years earlier. Its first rector, the Reverend Robert Addison, chaplain of Upper Canada's first Legislative Assembly, numbered among his parishioners Lieutenant-Governor John Simcoe, Lieutenant-Colonel John Butler and Major-General Isaac Brock. 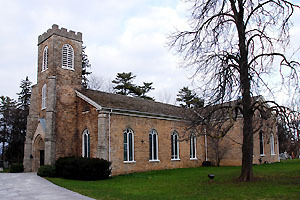 Completed in 1810, the church was used by the British as a hospital in 1812 and by the Americans as a barracks in 1813. Burnt by the latter, the nave was rebuilt by 1822 and the church consecrated six years later. In 1843 the structure was altered by the addition of the transepts, chancel and the present Gothic Revival pulpits. Further interior alterations were made in 1892 and 1964."